Welcome to Uluru - Kata Tjuta National Park. Sit back and relax as you travel into the amazing National Park while your Driver Guide shares insights into the natural and cultural history of this fascinating region. Enjoy a light breakfast and warming tea or coffee while you begin to absorb the enormity and beauty of your surroundings. Board your coach for the drive to the sacred site of Kuniya Piti, the start of your 10.5km walk. You'll be captivated as your Driver Guide shares the Tjukurpa (beliefs and law of the local Aboriginal people, the Anangu) story of the Mala Men. The Mutitjulu Waterhole was once a valuable source of water for the Anangu. 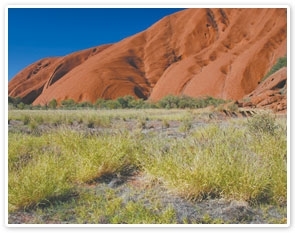 You'll see ancient Aboriginal rock paintings and learn about the Indigenous and European history of Uluru. After a short rest break, continue on along the Lungkata Walk, where your guide will tell you the Tjukurpa story of the cheeky Blue Tongue Lizard! Continue around the base of Uluru to the Mala Walk. Here you'll see some of the sacred sites where Aboriginal communities live and prepare for ceremony. Some believe that as you walk through this area, you'll be surrounded by the spirit of the Mala Tjukurpa - the hare-wallaby people. The vision of powerful waterfall in a desert setting is really something to see, particularly after rain when the water flows from the side of Uluru and plunges into Kantju Gorge. Complete your walk at Kuniya Piti, where you'll board your coach and receive a certificate of your achievement - walking the base of Uluru! Good level of fitness required. Includes a lengthy 10.5km gentle walk on flat ground.